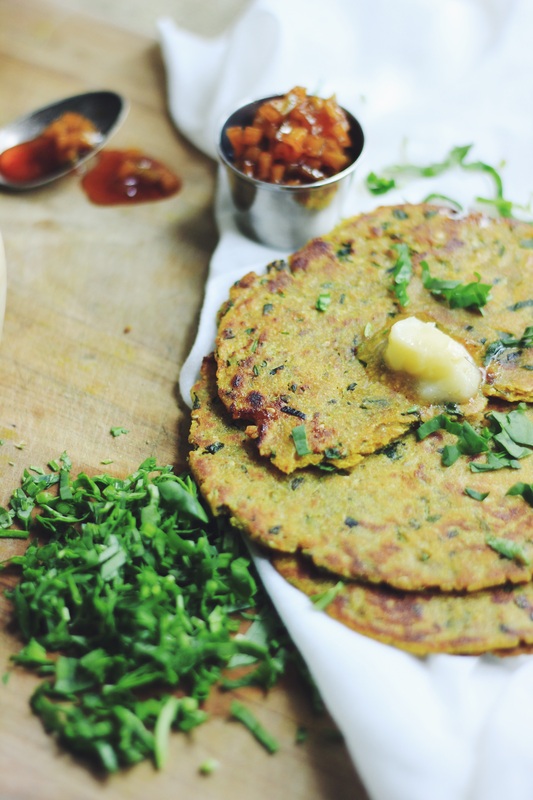 Methi Thepla, Methi stands for fenugreek leaves and Thepla means hand pressed, not rolled. This technique produces very soft and moist flatbread that stays well for days at room temperature making them perfect snack to take along on long trips. I remember my grandmother as well as my mom making this flat breads starting with hard dough, softening by pressing small portion by hand on a muslin cloth and using water as she worked through it. This traditional hand pressed method for making thepla produces uneven texture on the surface of the flatbread like ridges and valleys. 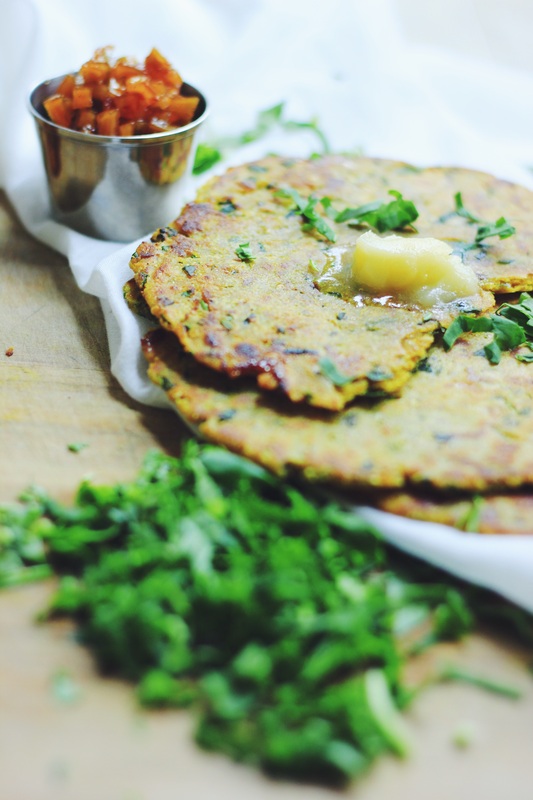 Ridges directly in contact with hot griddle would get crispy and the valleys would cook through steam, making flatbread both crunchy and soft which is also savory and sweet at the same time, characteristics of Gujarati cuisine. Traditional Gujarati dishes are quite complex in taste and that’s what makes them very satisfying to the taste buds. Wonderful balance of sweet, sour, salty and spicy taste all at once along with textural experience. Its like food playing melody in the mouth. 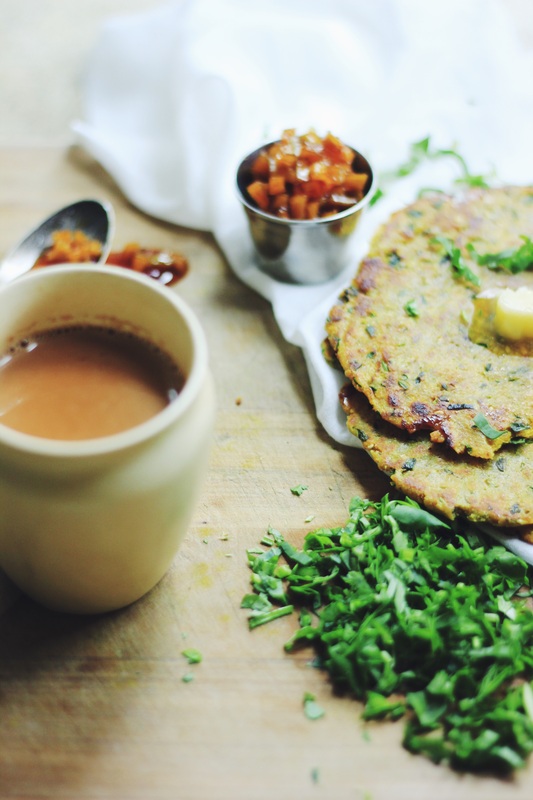 And this thepla is just one of the many treasured recipes from that region. Thepla recipe varies across region and from one household to another. My recipe has evolved too from my mom’s original recipe. I have been making it gluten-free and have added my own twists like amachur powder to add tangyness, oat in place of wheat flour and sorghum flour along with millet flour which adds nutty flavor. 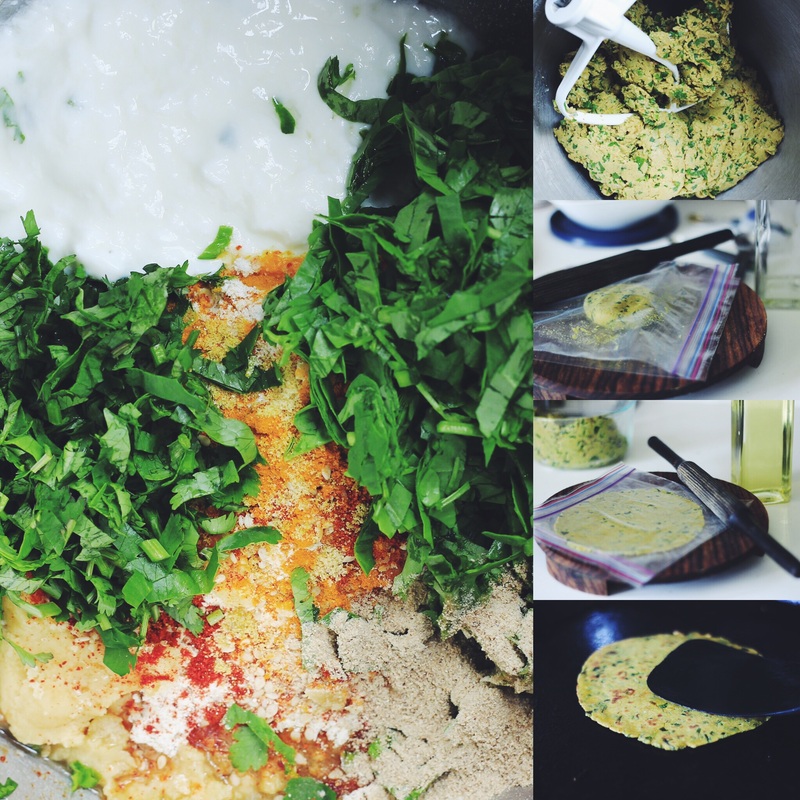 My mom makes this recipe predominantly using freshly ground millet flour. The store-bought flour that we get here is no way near that in taste but by making those changes I mentioned earlier makes the end result close to hers. Soft and flaky flatbread. Try out and let me know what do you think about it. Gluten Free Fenugreek flatbread, staple snack of Gujarat. 1/4 cup water, this will depend upon the age of the flour…older the flour more water is needed and vice versa. So look out while adding water, when the dough seems coming together you can stop adding water or add a tbsp more water if the dough still seems dry. This version is made using rolling-pin since I am like you live an over scheduled day/life, who still want to enjoy the goodness of traditional recipes and serve them to family w/o spending hours in the kitchen. I use kitchen-aid stand mixer to help prep the dough, hands free-mess free, making it even more efficient on those busy weekday mornings. Mix all the ingredients in kitchen stand mixer bowl with paddle attachment. Turn the mixer on low-speed for a minute and then on medium speed for 2-3 minutes until everything is combined, finish with 1 tsp oil once the dough comes together while the mixer is still running. See picture for the reference. The end result should be play dough like dough. Not too hard and not too soft. Hard dough will produce dry and tough thepla and too soft dough will be hard to roll. If for some reason the dough turn out softer than usual sprinkle dry flour before rolling which will prevent dough from sticking to rolling pin and rolling board. If you are mixing dough by hand mix all the dry ingredients along with fenugreek/methi leaves and cilantro and mix wet ingredients together. Now add wet ingredients to the dry ingredients to form dough, finish with 1 tsp oil once done. Divide the dough in to equal parts. Approximately 10-12 pieces. Take one part and place between two ziplock/plastic bags as shown and roll paratha approx 6″ in diameter. Use a drop of oil on each side before rolling if the dough seems to stick to the ziplock/plastic bags. Cook each thepla for few minutes on each side and after the second side is done, roast on medium flame adding 1/2 tsp oil while turning. Serve warm or cold with ghee, butter, masala Tea or pickle of your choice. Shown here is sweet raw mango relish. Note: Prepared dough can stored in refrigerator in an air tight container for up to 3 days so you can make fresh thepla when you want. Very convenient and can consider for diabetic diet too. Thats a good point you have brought up. Lot of the ingredients used here are good for diabetic diet. Almost all ingredients for diabetic diet just except jaggery. You can replace with date sugar that too. By the way, I like your presentations and all the pictures and it must be delicious as always your all recipes. Thank you so much, my try is to make everyday recipe easy and efficient.